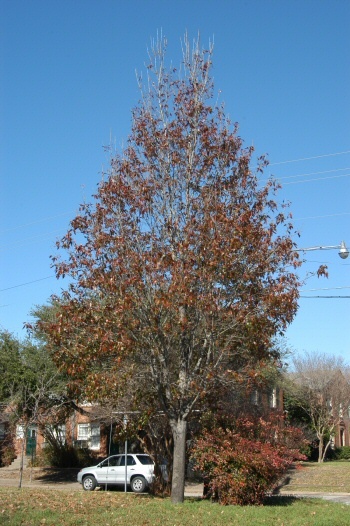 Habit: Semi-evergreen shade tree for full sun. Height: 50 feet. Spread: 30 - 40 feet. Native stands in Mexico may reach 80 feet. Spacing: 20 - 30 feet. Upright, red oak relative tree with a very neat appearance. It has a pyramidal form in youth and an open irregular shape at maturity. It is mostly evergreen in zones 8 and warmer. Its leaves can range from 4 to 8 inches long and 2 to 3 inches wide with heavily serrated edges, dark, and glossy green. The petioles are often reddish in color. Some canby oaks will turn red or yellow in late fall and keep that color all winter. Trunks are silver to almost white when young turning grey-brown with age. Culture: Easy to grow in most any soil. Should be used much more often. It has been successfully grown as far north as Springfield, IL, and have thrived in the intense Phoenix summers. Can take -20°F, USDA Zone 5 - 10. Uses: Shade tree with long lasting foliage. Fall is long lasting and often very strong. 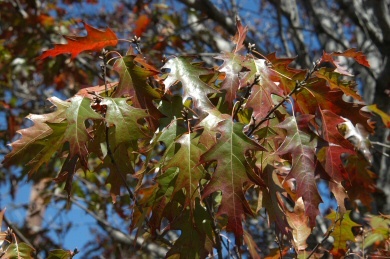 Problems: None serious other than it sometimes crosses with other oaks that will have chlorosis problems in alkaline soils. Beautiful tree that should be used much more. 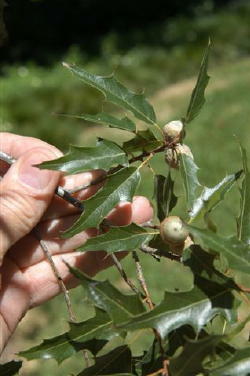 Notes: Chicos oak and evergreen oak are similar trees. Simpson’s A Field Guide to Texas Trees explains the differences among them best by saying that the Chisos oak grows primarily west of the Pecos, the shumard red oak grows west and north of the Balcones escarpment and the White Rock escarpment just west of Dallas and the canby oak grows east of that line. 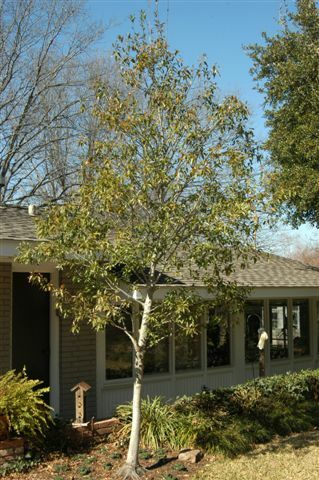 This mostly evergreen oak was first recognized by and brought into the trade by famed Texas plantsman Lynn Lowery.